We understand how finely-tuned tools are everything to an artisan. The right brush tip, color, paper type or pencil hardness makes a difference to your final product. We believe in offering you the deepest customization on your tools so you can have the exact tool you need, right where you need it — at your fingertips. Here’s how you can set up your menus, brushes and tool presets in Concepts so you can feel comfortable drawing and access your favorite tools quickly. 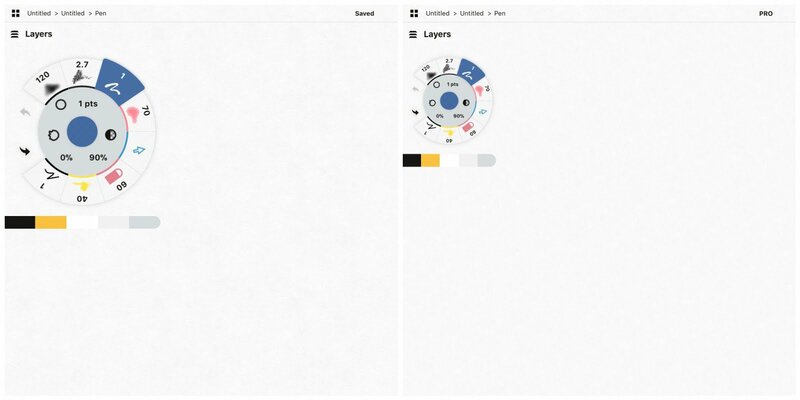 When you first enter a drawing, you’ll find an infinite canvas with your tools located on the Tool Wheel. 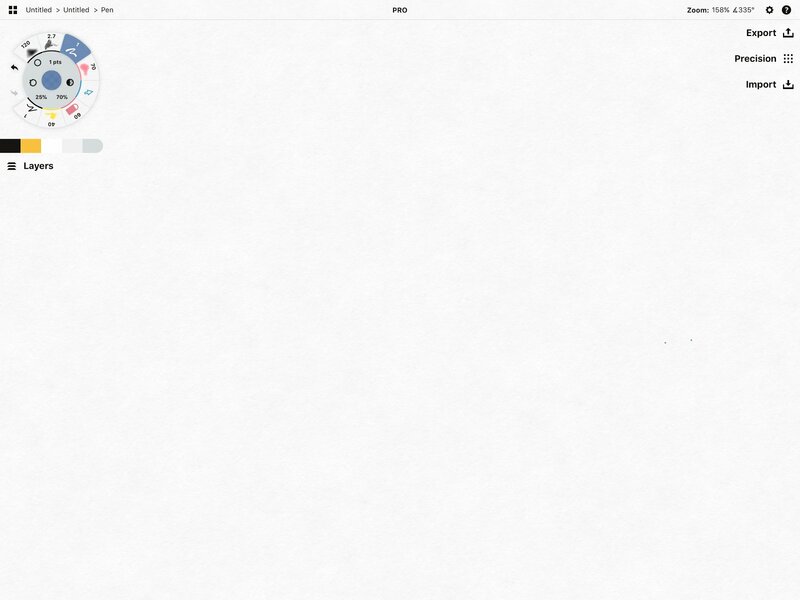 You’ll also see several menus on either side of the canvas. One of many layouts for your canvas. You get to choose your layout. 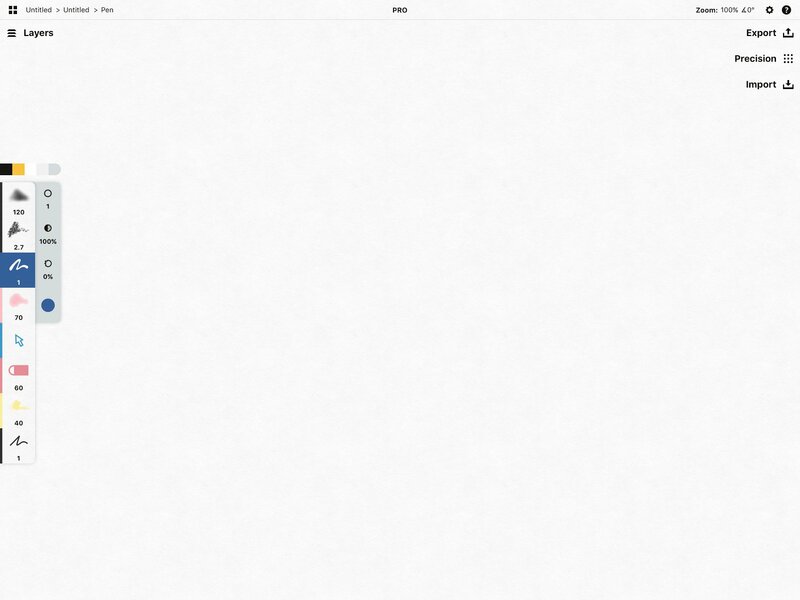 Every menu can be moved so you can create your most comfortable sketching layout. If you’re right-handed, move your menus to the left; if you’re left-handed, move them to the right. Or try a bit of both. 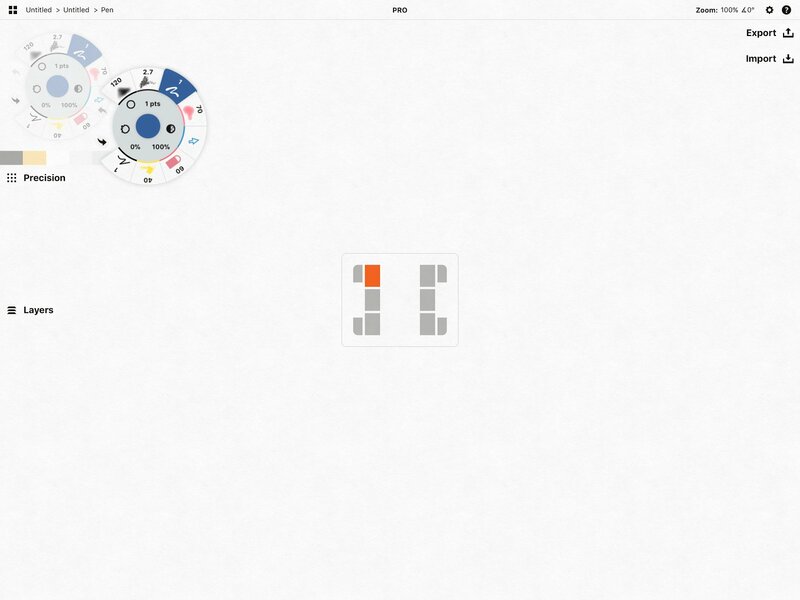 Just tap+hold the outer ring of the tool wheel or any menu, and drag it across the screen. You’ll see a layout of your docking positions appear to show you where you can place it. If you move it to the center of the left or right edge, the tool wheel will change to a more traditional Tool Bar. You can dock multiple menus inside one station to maximize your canvas space, and drag them up or down to rearrange their order. Don’t worry... when you expand a menu, it will adjust with the others as necessary. Moving the Precision menu on the right. The menus will hide if you draw too near them, but if they’re just getting in the way, you can collapse them or hide them completely. Slide your finger horizontally across any menu toward the edge of the screen to collapse them. Compact Mode. The menu labels have disappeared and your Tool Wheel is now spinnable. On iPhone (right), the wheel is always docked in the corner. Slide your finger over the icon a second time to make the menus disappear from your canvas. Hidden Mode.  This canvas intentionally left blank. Tap the little tab in the corner to bring them back. To expand the menus from compact to full view, slide your finger inward on a menu tab. Or you can tap+hold the outer ring of the tool wheel and reposition it. You can also resize the tool wheel to fit your hands by pinching or expanding it with two fingers. Bigger tool wheel, smaller tool wheel. 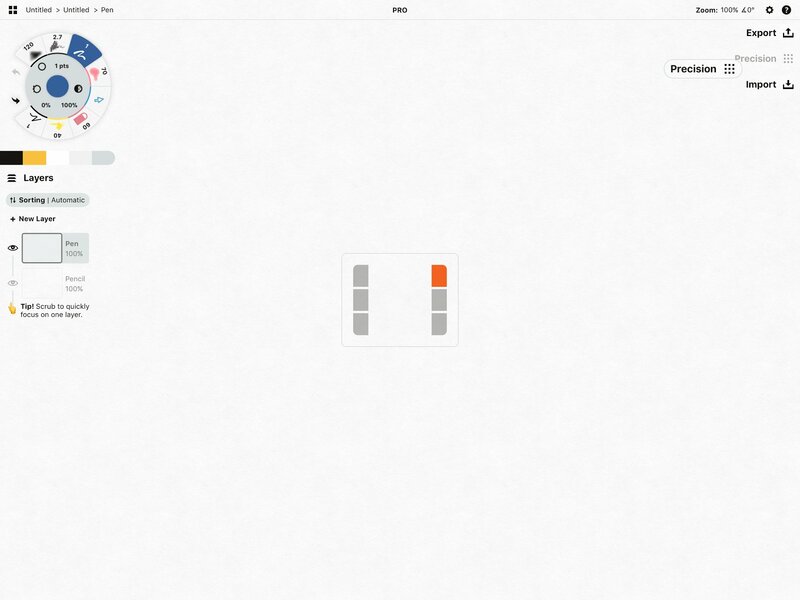 Tap on a tool to select it for drawing. To adjust your brush’s size, opacity or smoothing, use one of the options in the inner ring of the tool wheel (or inner edge of the tool bar). Tap one to bring up a customization slider, or if you just want to be quick, slide your finger across it. Size. The empty circle represents the brush’s size. 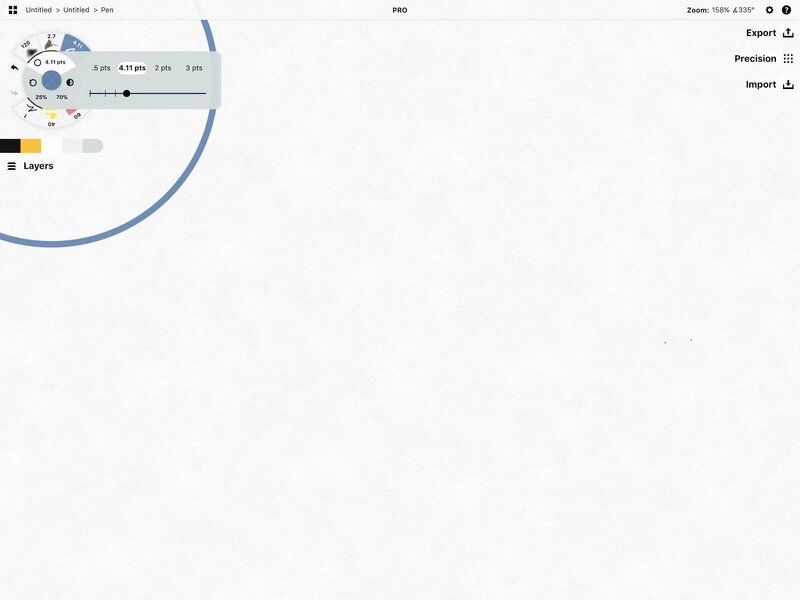 You can set it to pts, mm, inches or other metric in Settings -> Workspace (tap the Settings gear on the status bar). Opacity. The divided circle represents the brush’s opacity. 100% gives you the most solid color available for the brush, 0% makes it completely transparent. Smoothing. The bumpy circle represents the brush’s smoothing. 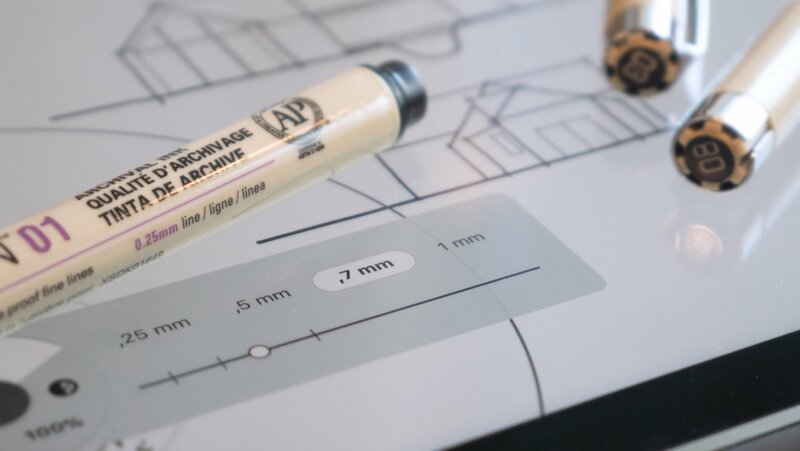 0% is a raw, hand-drawn line, 50% smooths it considerably, and 100% gives you perfectly straight lines from start to end point. This tab is where you set your brush size. On the slider, notice there are four brush values for that tool — these are your Tool Presets. Tap a value to draw with that preset. Slide your finger along the slider to change the size value. 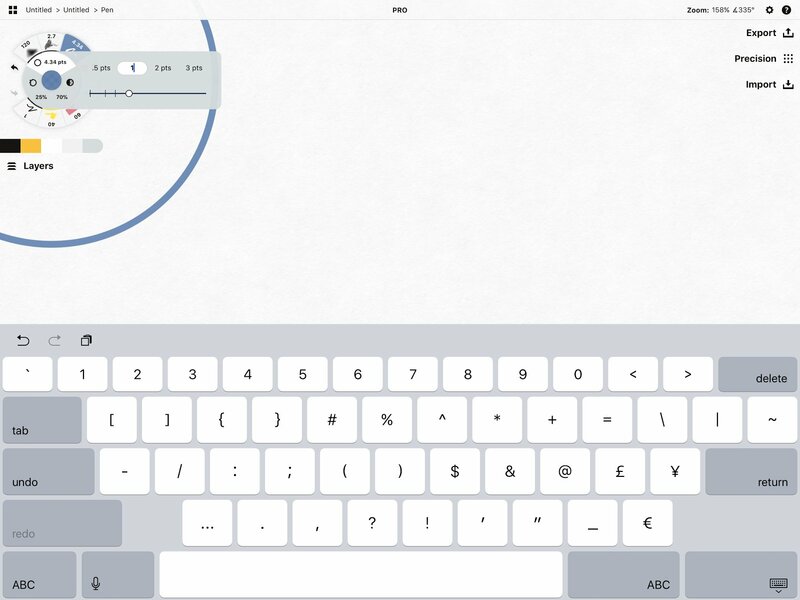 Tap+hold the tool preset to enter a value with the keyboard. 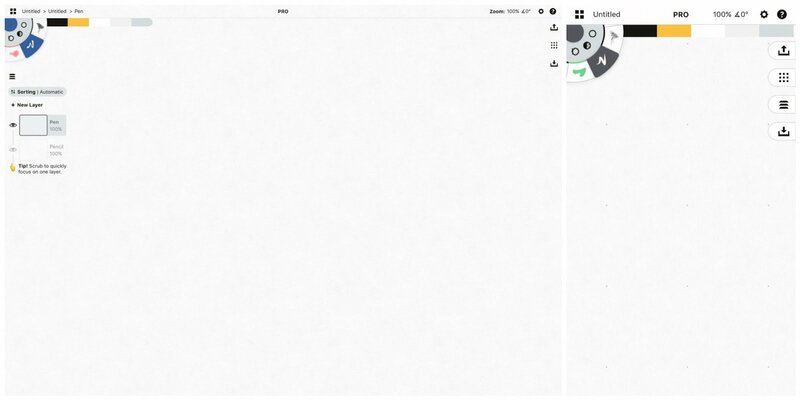 If you tap your active tool a second time, or double-tap an inactive tool, you’ll bring up the Brushes menu. 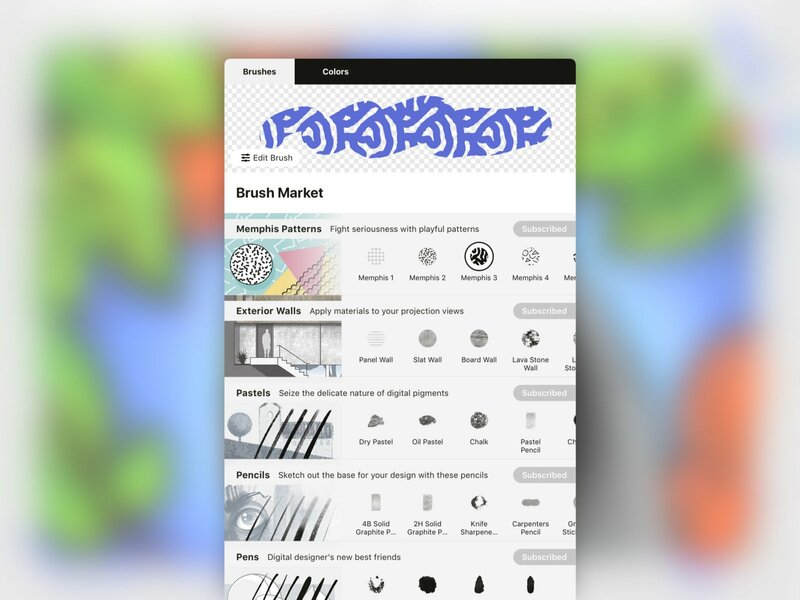 Here in the Brushes menu, you‘ll find your basic brushes and tools, brushes you’ve created with the brush editor, and many artistic brushes in the Brush Market. At the top of the menu is your brush viewer. This shows what your current brush looks like in its current color against a transparent background (as vector stroke properties are independent of background). You can scribble inside the viewer and try your brush. If you scroll down, you’ll see the menu is divided into sections. 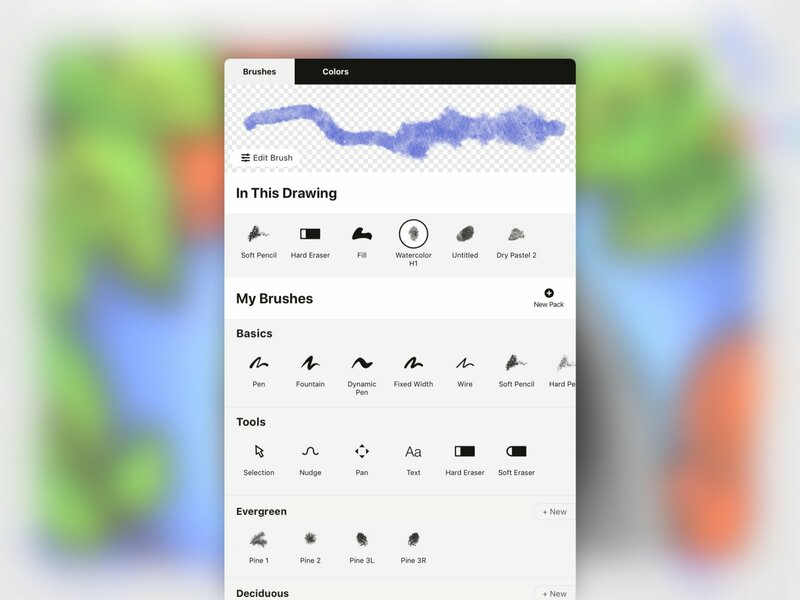 In This Drawing gives you quick access to your current drawing’s tools. My Brushes includes all basic tools and any custom brushes you’ve created with the brush editor. The Brush Market is filled with artistic brushes. You can purchase individual libraries with credits in-app, or subscribe and use every brush in the market. 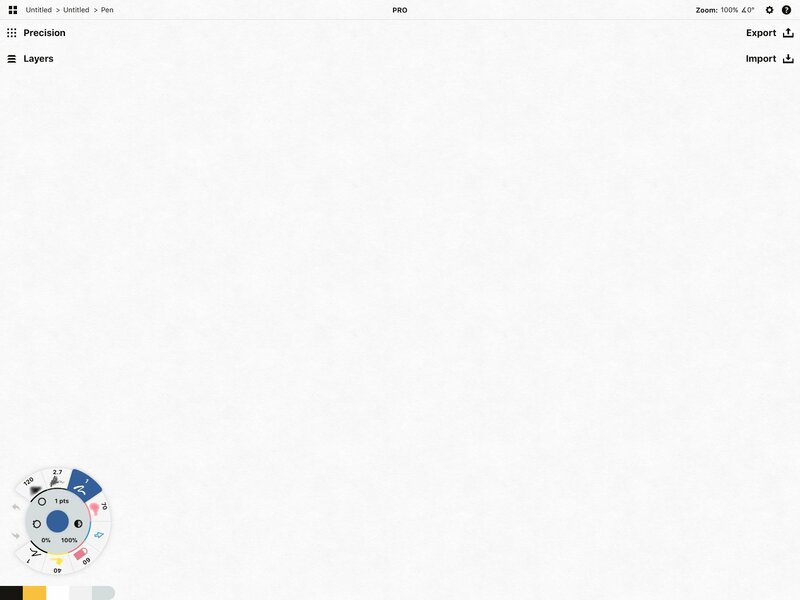 Choose a tool from the menu, then tap outside the overlay to return to the canvas and start drawing. Remember that every slot on the tool wheel is customizable so you can set up your ideal workspace. You’ll notice a second tab at the top of the overlay called Colors. 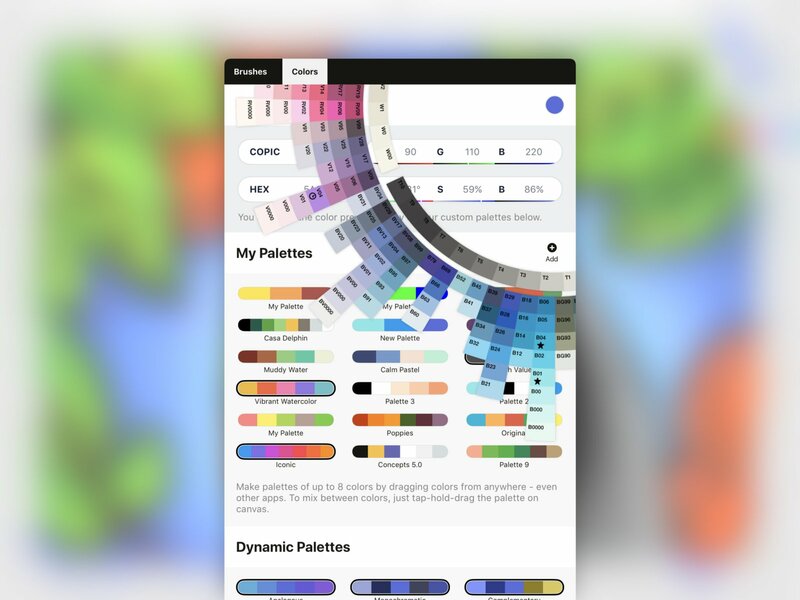 This menu has a full set of useful abilities - read about colors, creating color palettes, and mixing colors here. Concepts remembers every setting you used in each drawing, including your brushes, tool presets, colors, canvas and other settings. Enter a drawing that uses your preferred set-up. Many people set up a blank “template” drawing at the beginning of each project. Exit back to the Gallery. Create a new drawing. The previous drawing data will carry over to the new drawing so you can get right to work. Do you have questions about brushes, tools and presets? Talk with our team at concepts@tophatch.com and we’ll be happy to help.